So the story goes like this: He participated in the Japan's Iron Chef cooking competition and lost by a mere half point. 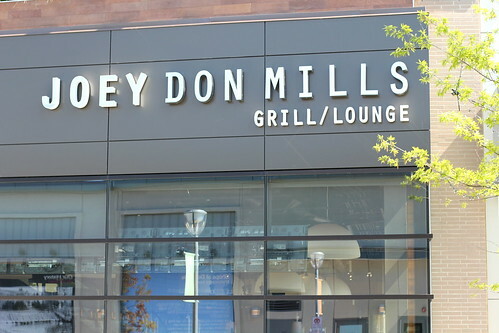 He is Chris Mills, a Canadian chef, who help inspired many of the items at Joey Don Mills. It was a wonderful day with plenty of Sunshine and light breezes as well. People were sitting outside enjoying their lunch under the warmth of the sun. 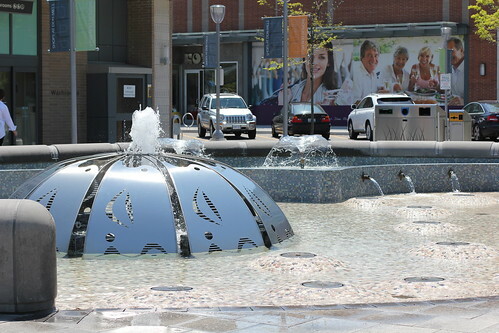 This new mall establishment was one of its first kind in Toronto, following a so-called Californian open-style mall with shops and restaurant all situated outdoors. 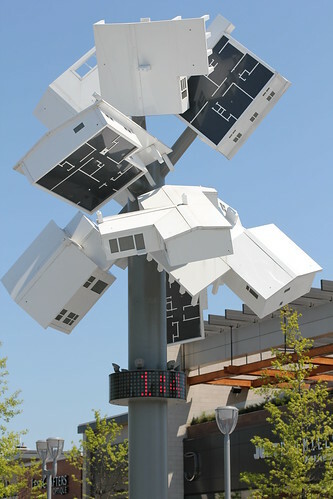 (meaning you have to get outdoor to go from one shop to another) It was a nice concept indeed but not quite certain how well this fit in Toronto when 1/3 of the year is either winter with plenty of snow! 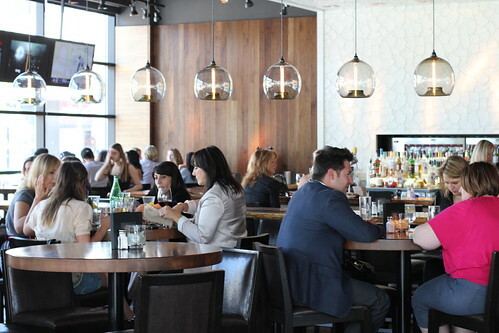 The resto has two main sections, one the proper dining area and one in the lounge / bar area. It has a roof top bar / patio as well but was closed for the day! argh! We picked the bar / lounge area so I can have a better view of ... everything! I could not really get my eyes off the ... little black book on the table and the tall pretty waitresses. 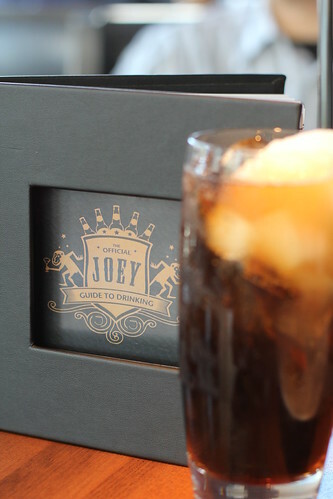 It was a Joey's Official Guide the Drinking???? It was pretty funny! Lesson No. 6 was on Urinal Manner (when drunk I suppose) HAHA ... I think you get the picture and what the rest of the lesson is about. I wish they have a web version! 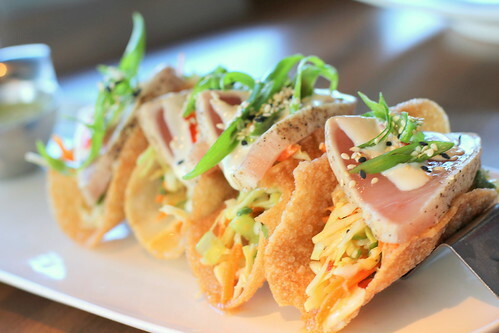 One of the famous items under Chris Mills' inspiration was the Ahi Tuna Taco. Alright, I had to admit it was good! The mushy tenderness of the tuna together with the crunchy taco was a nice combination. The slightly sweet and sour sauce elevated the flavors. We almost ordered another one because I wanted the whole dish to myself!!! 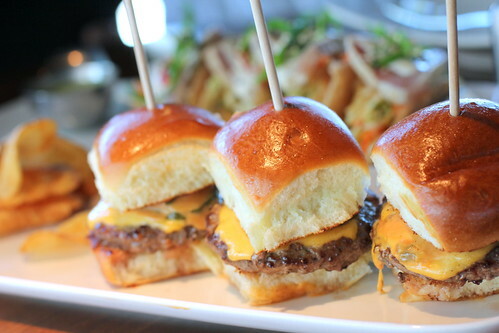 The Cheeseburger Sliders were unexciting but cute. 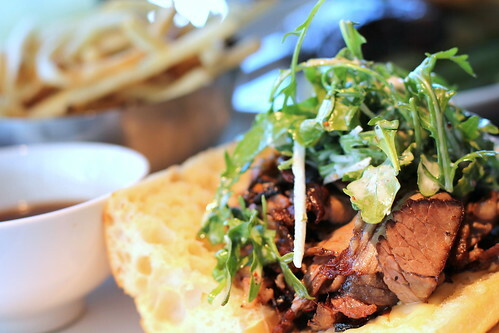 The Beef Sandwich was tough to share but aside from that it was alright, meat was tender and flavorful. Again, best to be enjoyed by eating with your hands!!! 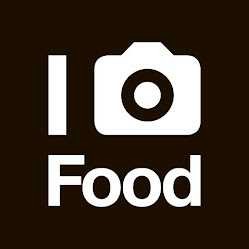 When I happy I eat, when I am happy and hungry, I eat a lot! 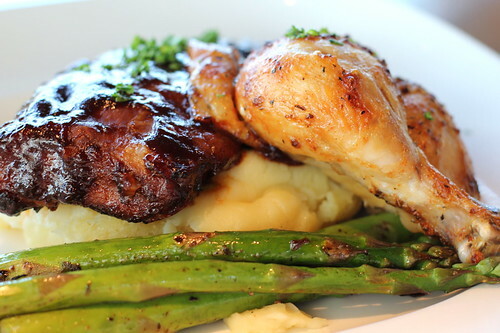 Rotisserie Chicken and Rib Combo. Chicken was a bit overcooked but the ribs were nice! these two items were wonderful combination if you ask me and it went well with the any allophonic drinks! haha ... We should have ordered MORE fries as well! I would certainly return again if I have the chance to try some of the other interesting items and perhaps go through the whole Official Guide to Drinking! 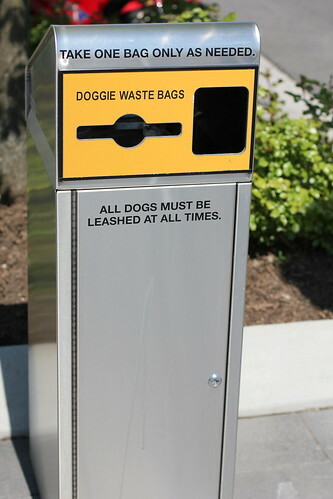 I am not sure if this is appropriate to show her after all the delicious items shown above,but I found the Doggie Waste Bin quite cute!